Newly published CO2 figures for the Toyota Prius line-up provide clear evidence of how tax costs could go up for fleets in the coming months as a result of re-testing for the new WLTP drive cycle, which came into force last September. The Prius will no longer be eligible for Congestion Charge exemption under the new NEDC-correlated figures. Aimed at providing more representative ‘real-world’ fuel economy figures, the new Worldwide harmonised Light-vehicles Test Procedure (WLTP) came into force on 1 September 2017, replacing the outdated New European Drive Cycle (NEDC). Manufacturers have 12 months to re-test their entire model range under the new regime. However, as WLTP typically produces higher CO2 and fuel consumption figures than NEDC, there’s a transition period to enable manufacturers to reach the EU’s 95g/km average by 2020/21, where both figures will be produced. WLTP data will be converted to NEDC using a computer tool to avoid doubling up on tests, and reduce the burden on manufacturers. In the Autumn Budget last year, it was confirmed that VED and Company Car Tax (CCT) will continue to be based on computer-generated NEDC (New European Driving Cycle) fuel economy and CO2 figures until April 2020 – a move welcomed by the fleet industry for offering longer-term clarity. However, the transition period is also likely to spell tax hikes for many models. Jato data from last autumn, published in a white paper, showed the first ‘NEDC Correlated’ CO2 emissions are up to 18% higher than genuine NEDC-derived data, in turn impacting on fleets looking to replace like for like. Toyota’s first NEDC Correlated data backs this up, with the Prius, Prius Plug-in and Prius+ showing CO2 and fuel consumption increases across the board. 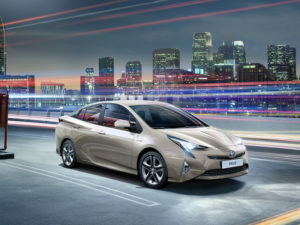 The Prius sees NEDC Correlated CO2 emissions rise from 70g/km to 78g/km for models with 15-inch alloys and 82g/km for 17-inch alloys, meaning it’s no longer Congestion Charge exempt, while bringing about a jump from 13% to 17% BiK. Meanwhile emissions for the Prius plug-in hybrid increase from 22g/km to 28g/km while the Prius+ rise to 106-112g/km. That’s despite the car itself undergoing no mechanical upgrades. Despite the brochure figures changing, a 2017 and 2018 model year Prius will still record the same fuel economy under real-world use. But it hints that NEDC-based taxation could cause some unexpected rises in tax liability for operators and drivers. The publication of the new NEDC-correlated figures for the Prius trio come as the 2018 Prius and Prius+ gain new equipment while the Prius+ trim line-up is simplified to two trim levels, covering Icon and Excel.